With the rise of Metahumans a secret organization decides to create a team to combat this imminent threat; Team 7. After the team is assembled they are equip with state of the art weapons and given their first mission. Art-Jesus Merino’s art adds such depth to the story you cant help but love it. 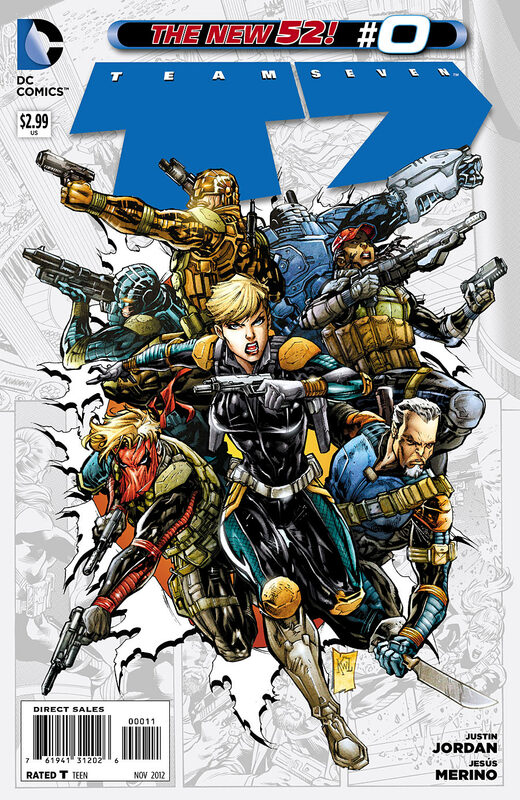 Cover- The new Team 7 in its glory; Amanda Waller, Dinah Drake, Cole Cash, Kurt Lance, John Lynch, James Bronson, Alex Fairchild, Slade Wilson, Summer Ramos and Dean Higgins; Radically different from the Team 7 of Widstorm comics. Exciting-The introduction of each new team member was typical recruitment fare but, man if I wasn’t excited with the turning of every page. Black Hero- Amanda Waller’s past before the suicide squad is about to be fleshed out and we can dig it! Missed opportunity- While this new team does excite me, I miss the inclusion of Isiah King/Despot. His fall from grace story was highly reminiscent of Anakin Skywalkers transition to Darth Vader, huge loss on the story potential on that one. I quite like the blond guy with the red tissu mask and … Woaw, the body of Superman is still so perfect !! This man just does not exist in reality … I’m sad ! Despot was on Team One not Team 7. And DC has butchered the root of what makes Team 7 great and made Grifter a character with no depth. He was about doing the right thing at all costs. Look up the origin of his mask.